What is the best way to close out a course? The current gamification trend suggests updating some tried and true methods. Below is a classic Toolbox post on how to turn the last day into a game of Jeopardy. However, MBA students at the University of South Florida have recently updated it with a very slick PowerPoint version that is really worth checking out. Since the file has macros, you will need to download it and run it in PowerPoint (can’t be viewed otherwise). The categories and questions can be edited in PowerPoint. 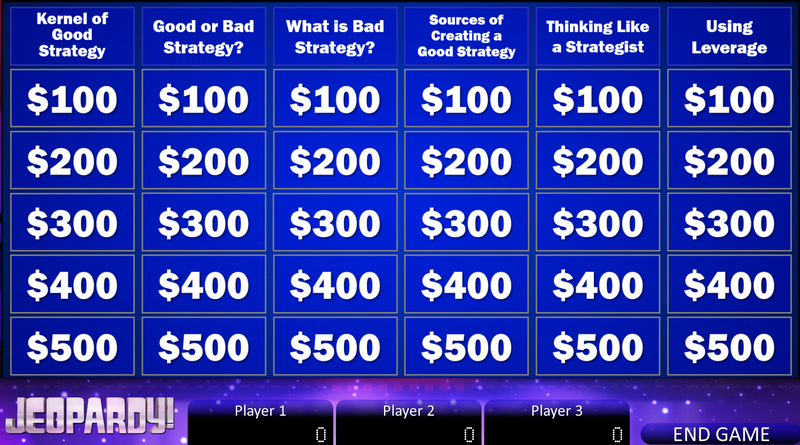 The students read Richard Rumelt’s Good Strategy, Bad Strategy and turned the key points into Jeopardy questions. They then used buzzers (below) and the file above to run a Jeopardy-based class exercise. (Thanks so much to Erwin Danneels and his students, Pranali Panjwani, Elliott Parker, Blesson Mullappally, Saharsh Kislaya, Bikash Patra, for sharing). If you want to add some spice to this exercise, you might get a set of buzzers that contestants can use to get control of the board. Here is a link for a reasonably priced set of buzzers on Amazon. This can also be done in a lower tech manner by using a white board for the categories and dollar amounts. One can also have Daily Doubles and a final Jeopardy question. The ‘prize’ might be that the winning team gets extra class participation points for that day. Alternatively, one might find other meaningful prizes to distribute. Here is another take at Jeopardy Questions in a word file. As you can see, they are a mix of course ideas and fun topics. For the category ‘Before and After’ (which is the hardest), the instructor would display the question on a projector so students could read and think about it (otherwise one can just read the questions). The BINGO (actually called STRATEGY). This consists of two documents that are attached. First, I created 16 different playing cards by putting on words I expected to use in class. Then, I created a list of additional words that I expected to use. I instructed students to take one of the playing cards and then fill in the blanks with words from the list. By partially completing the card, I saved class time. By having students finish the card themselves, I ensured that each card would be different. I only used this approach once, but should use it again. The particular topic the day I used it was ‘competitive dynamics’. I think the topic was a bit too hard for the students, but they seemed to like the game. The two winners in each section received a $5 Subway gift certificate. In classes that have a distinct international bent, I use a simple case-based exercise to kick off the first class. The Ivey Case 9B11M107, “Where have you been: An exercise to assess your exposure to the rest of the world’s people,” is a fun way to show participants both how diverse the world is, along with how little exposure they’ve actually had to the rest of the world’s people than they previously thought. Are Internal Capital Markets Better for Selfie Sticks? Enter your email address to follow the Toolbox and receive notifications of new posts by email.